Classic games from then and now! Plan a family game night! Based on the beloved fairy tale. 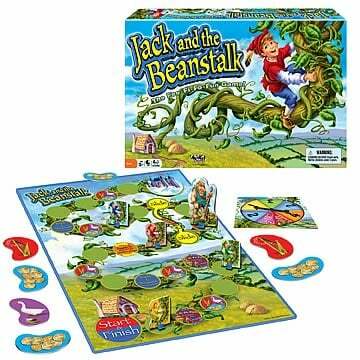 Race up and down the beanstalk collecting treasures! Includes Gameboard, 4 Jack movers with bases, 1 Giant mover with base, 30 die-cut treasure cards, spinner, and instructions with story.